Given that all lcd’s have some motion blur, does motion blur in it of itself simulate or create flicker? I get we can get higher refresh rate monitors for PC gaming to minimize motion blur but what about those with 60hz console games or even most media content which is 24fps? 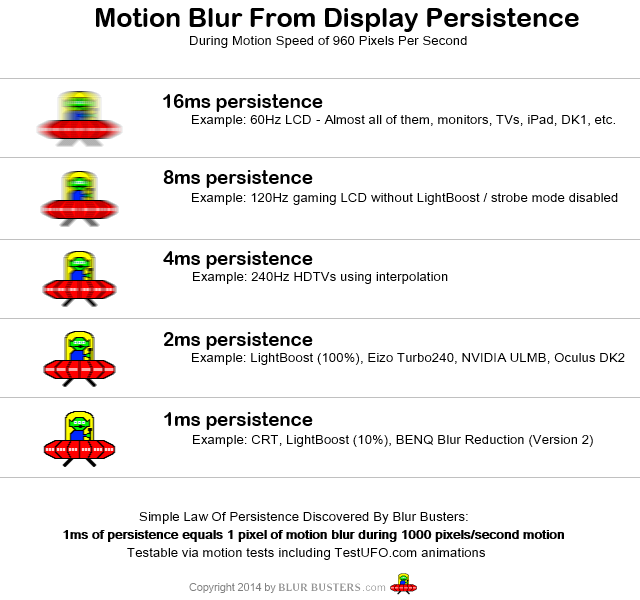 link wrote: Given that all lcd’s have some motion blur, does motion blur in it of itself simulate or create flicker? Really? Then what is the website displaymate talking about? Well, motion flicker is not actual flicker. Actual flicker is when the whole display switches between different colors or brightness levels. Motion flicker does not do that. Also, motion flicker is not caused by motion blur. It's caused by the sample-and-hold nature of unstrobed LCD displays. Sample-and-hold is what causes motion flicker. It's not motion blur that causes it. In fact, motion blur can reduce motion flicker. This is why the answer to "does motion blur cause flicker" is "no"
Because 30FPS still has motion flicker, most 30FPS-locked console games use motion blur to hide it. Applying motion blur reduces motion flicker. There's a test you can do yourself to see how motion blur reduces motion flicker. If you have Doom 4 installed, use RTSS and apply a 30FPS limit. Make sure motion blur is disabled in the game's settings. You will get severe motion flicker. Now enable motion blur in the game's settings. Crank it up a lot. This will eliminate motion flicker almost entirely. 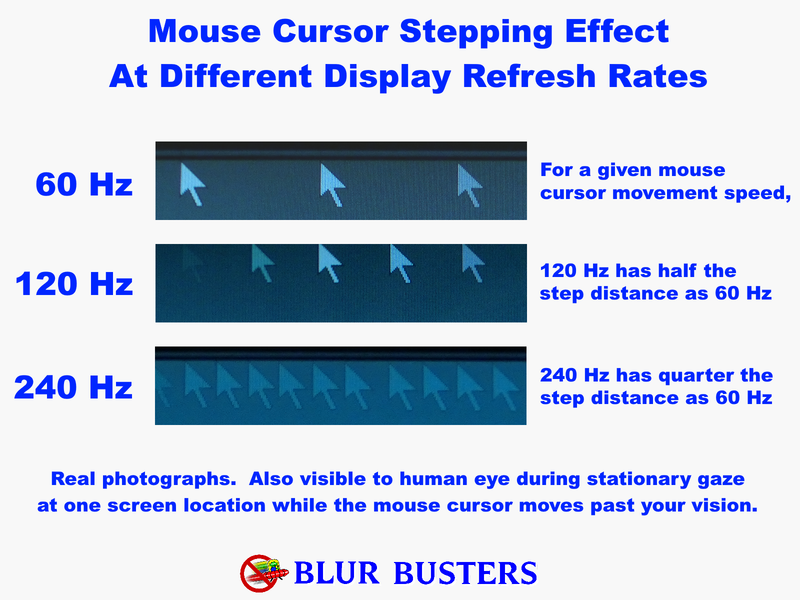 RealNC wrote: This is why the answer to "does motion blur cause flicker" is "no"
There are many causes of flicker, ranging from LCD inversion artifacts (which can amplify during motion), impulse driving (like a CRT), or the stroboscopic effect (like TestUFO Mouse Arrow). But one common cause of flicker during motion that is universal to 100% of all displays ever invented by humankind, is the edge flicker effect of low-framerate motion running below refresh rate. Whether 48Hz double-strobe 24fps film projector (soft double image), or 30fps on 60Hz CRT (clear double image), or 20fps on 60Hz LCD (softer/blurrier than CRT but still edge-flickery). As long as the flicker is within your sensitivity threshold, that is. The artificial humankind invention of using a series of static images to emulate moving images -- invented since the days of flipbooks and 19th century zoetropes -- is full of fascinating side effects such as wagonwheel-effect, edge-flickering, etc -- Much of which are well-summarized at Blur Busters Law And The Amazing Journey To Future 1000Hz Displays (the long-term humankind journey towards cheaply mimicking an analog-motion framerateless display). Fundamentally, this is the raison d'étre of the very existence of Blur Busters! We accidentally exist because of the artificial humankind invention of the "refresh rate" and the "frame rate" that real physical world does not meaningfully have. And all the various fun technology band-aid slapping-on that need to do. Because of law of physics limitations of today's technology. Like flashing a light (strobe backlights like LightBoost) to fix blur, raising refresh rate (to fix blur or stroboscopics), varying the refresh rate (to fix stutters), fix latency enforced by a finite frame rate or refresh rate, and all that entails. At least until we successfully mimic an analog-motion display (or a reasonable fascimile thereof, such as ultra-fps at ultra-Hz). It may take decades before we have cheap framerateless video files playing back on cheap framerateless displays. Motion blur and edge flicker actually is the same cause. It's either blur or flicker though. It's like a guitar string. A guitar string that is plucked. Strings can look either vibrating or look blurry. High-Hz guitar string = blends to blur. Different people will have different flicker sensitivity thresholds, and the pixel response speed will affect the threshold, where the edge-flicker (of low framerate motion) blends into high-Hz. Look at the top half which is a simulation of variable refresh rate. As it ramps to 30fps, it noticeably edge-flickers instead of blur. As it ramps to 60fps or beyond, it noticeably motion-blurs instead of edge-flicker. The amplitude (vibration span or blur span) will follow Blur Busters's Law. Doubling framerate (assuming Hz room) will halve this amplitude. The effect is just like a guitar string, or piano string, or harp string. Whether it's edge-blurring or edge-flicker (of edges of moving objects) -- depends on the frequency (aka framerate on VRR) and your flicker sensitivity threshold. Just like with a guitar string too, the flicker-vs-blur sensitivity threshold is likewise different too. Person A: "That 80Hz piano string looks like it's vibrating to my eyes"
Person B: "That 80Hz piano string looks like blurry to my eyes"
The flicker versus blur threshold will vary in the territory of under-30Hz thru above-100Hz depending on human sensitivity, lighting conditions, direct vision versus peripheral vision, amplitude of vibration, flicker duty ratio (if not 50%:50%), squarewave-ness versus softness of flicker (for edge-flicker on displays, this is affected by GtG), etc. You've seen wild estimates all over the place. The most common number -- for direct-visibility of flicker -- would be the ballpark of roughly 60Hz-ish but it has extended way below to way above during favourable variables especially with outlier humans (unusually flicker-sensitive persons). Sometimes the phantom array feels like flicker to some humans. In fact when a 120fps motion test has two independent-direction moving objects (e.g. one object moving in separate directions from the other), the edge-flicker of the other object can sometimes turn into a stroboscopic / phantomarray effect (despite being above your direct flicker sensitivity threshold) even though neither motion are static. It's basically "Everthing is Relative" to your current gazepoint. A fixed gaze on a flicker (direct view of that specific stationary or moving object) will have the lowest sensitivity threshold to whatever artificial "humankind invention of frame rate" artifacts (e.g. under 60fps), but your indirect sensitivity will often go into the quadruple/quintuple digits thanks to indirect effects such as wagonwheel effects or stroboscopics (e.g. >1000fps+). One person's "That looks smooth" is another person's "That doesn't look smooth", especially if they are 100x more bothered by stroboscopics than YOU are. Everybody sees differently -- in fact, 12% of population is colorblind according to stats. But vision is much, much, much more complicated than that. One of you may see a primary color peak at 5 nanometers differently than the human next to you (meaning color gamut of one monitor of 98% NTSC looks more like 92% to you because your eyes are just slightly off by a few nanometer color but not enough to be declared remotely nearly color blind). Now. Opening more pandora boxes. Have you heard of motion blindness? It's called Akinetopsia. While extreme cases are rare, many humans are at least a few percent less sensitive or more sensitive than you are. Not enough Pandora's Boxes? Okay. Here's more. Some of you are bothered by brightness. Some of you are bothered by flicker. Some of you are bothered by tearing. Some of you are bothered by stutters. Some of you are bothered by blur. Some of it even causes eyestrain for you. Others wouldn't care less (and just want the best color only, or best latency only, or best resolution only, etc). There's rare humans that are so bothered by one artifact that a solution has to be found, like a different screen. Eye pain from tearing? Yes. Eye pain from stutters? Yes. We know. We know you exist. We know that here at Blur Busters and certainly respect that. Until displays perfectly match real-world framerateless motion, and can be customized to fix a specific human's eyes, displays are often perpetual compromises. Always. Fortunately, many are so good we couldn't care less as long as we're having fun playing games -- or at least doing our computer work without being bothered. In addition, pixel response speed of the monitor will also provide a bias effect. Or GPU-blur-effects added to frames (to eliminate the phantom array / stroboscopic effects). Your flicker sensitivity threshold will be slightly higher for fast-pixel-response displays like OLED and TN LCDs, since LCD GtG will lower the flicker-vs-blur crossover threshold, whatever your human sensitivity threshold is. It simply adds a slight biasing effect to your pre-existing human flicker-vs-blur sensitivity threshold. That means you might see edge-flicker at a slightly higher framerate (e.g. 75fps) on a 144Hz TN panel than you might see (e.g. 65fps) on a 144Hz IPS panel. Ok got it Chief. The thing is though for example at 60hz, one frame to another frame takes about 16ms right? So say that 16ms transition, does that display a double image or multiple images at once creating a sort of flicker or strobe effect? Or the transition of pixels from one frame to another there's always a delay say even the lowest TN panels are 3ms right? Does that transition with delay create a sort of flicker or strobe effect? And does the effect increase with higher response times? Since the previous frame is bleeding into the updated frame creating I guess double images. Or am I understanding this incorrectly? For example if you watch a YouTube video particularly a lower frame rate one say 30fps, if you follow a persons hand gestures one would make in normal conversation, you can kinda see a after image or trail or double image not sure how to describe it precisely. I could still be misunderstanding this and conflating.